The aviation industry in the US was deregulated in the 1970's with the Airline Deregulation Act. To jumpstart the industry environmental regulations were lifted and funding was cut to programs analysing the health and environmental impacts of aviation. This was done to release any barriers to growth. A distinct lack of public scientific study now exists on the impacts of aviation in the United States. Since the 1970's the airline industry has experienced explosive growth, yet the commercial aviation industry continues to struggle to remain profitable. This in turn keeps lawmakers from enacting legislation, which will require and fund studies on the impacts, curb growth and reassess aviation's role in transportation policy. According to the Department of Transportation in 2007, up to a tripling of passengers, operations and cargo by 2025 is predicted. Due to a legislative loophole, the DOT is not actually required to study how this massive increase in growth will impact the health, environment or aviation safety. To determine the actual effects of jet engine noise and emissions, we must review the work produced prior to deregulation of the industry and look to studies commissioned by non-profit health and environmental organizations, for-profit environmental consultants, universities, foreign governments and multinational environmental coalitions. Several governmental programs do exist to analyze the environmental impacts of noise and emissions, however funding for noise and air quality study is minimal and many do not make their studies available to the public. In 1996 the NRDC published a landmark study on the effects of aircraft emissions on air quality however funding was later cut for these programs. Unfortunately due to the harsh economic situation and legislative setbacks from prior administrations environmental organizations are struggling in their role to assist in this area. Conservationists concerned about immediate impacts of aviation noise and emissions in their communities are working with non-profit networks, universities, and their local governments to commission studies. Others are working with environmental scientists to produce white papers and meta data studies. The Department of Defense has commissioned several studies on aviation impacts however unique differences exist between commercial, general and military aircraft. Aircraft engine manufacturers are reluctant to share their studies on emissions and noise however Boeing has done an impressive job in making public aircraft noise profiles as well as noise mitigation programs across the world. Until legislation is enacted and funding sources flow into public and private programs to study the impacts, protecting the environment falls upon the shoulders of local communities, and environmental organizations with resourceful political action committees and unfortunately litigious action against aviation manufactures, airports and the FAA. The International Civil Aviation Organization Air Transport Bureau (ATB): is the leading voice in the world on the topic maximizes compatibility between civil aviation and the environment. According to the European Commission, emissions from aircraft raises the risk for stroke, coronary heart disease and increased blood pressure. More then 200 compounds including 147 VOCs, 15 carbonyl compounds, and 15 PAHs and 4 criteria pollutants including CO, SO2, NOx, and PM10 are known to be present in petroleum combustion based jet engines. 1,3-butadiene, formaldehyde, acrolein are cancer causing. Aircraft emissions impact local air quality at ground level according to the ICAO which in turn exact a quantifiable risk to human health. Larry West, an environmentalist hired by the FAA detailed some of the health effects that they recognize. "Aircraft emissions contribute to certain health risks." According to congressional testimony provided by Crowley, "pollution produced by LaGuardia Airport is a significant contributor to the overall asthma rates in the communities surrounding the airport. According to the American Lung Association's estimates of the prevalence of lung disease, there are 80,105 adults with asthma in Queens and there are 27,588 kids with asthma." The U.S. Citizens Aviation Watch Association has cited several studies linking pollutants common around airports--such as diesel exhaust, carbon monoxide and leaked chemicals--to cancer, asthma, liver damage, lung disease, lymphoma, myeloid leukemia, and depression. Ozone: Lung function impairment, effects on exercise performance, increased airway responsiveness, increased susceptibility to respiratory infection, increased hospital admissions and emergency room visits, and pulmonary inflammation, lung structure damage. Carbon Monoxide: Cardiovascular effects, especially in those persons with heart conditions (e.g., decreased time to onset of exercise-induced angina). Nitrogen Oxides: Lung irritation and lower resistance to respiratory infections. Particulate Matter: Premature mortality, aggravation of respiratory and cardiovascular disease, changes in lung function and increased respiratory symptoms, changes to lung tissues and structure, and altered respiratory defense mechanisms. Volatile Organic Compounds (VOCs): Eye and respiratory tract irritation, headaches, dizziness, visual disorders, and memory impairment. Ozone: Crop damage, damage to trees and decreased resistance to disease for both crops and other plants. Carbon Monoxide: Similar health effects on animals as on humans. Nitrogen Oxides: Acid rain, visibility degradation, particle formation, contributions to ozone formation. Particle Matter: Visibility degradation and monument and building soiling, safety effects on aircraft from reduced visibility. Volatile Organic Compounds: Contribution towards ozone formation, odors and some direct effects on buildings and plants. Tiny particles of air pollution -- less than one tenth the width of a human hair -- can trigger clotting in the blood, U.S. researchers said on Thursday in a finding that helps explain how air pollution causes heart attacks and strokes. Large population studies have shown pollution from the exhaust of trucks, buses and coal-burning factories increases the risk of fatal heart attacks and strokes. But researchers have not understood how these microscopic particles actually kill people. "We now know how the inflammation in the lungs caused by air pollutants leads to death from cardiovascular disease," said Dr. Gokhan Mutlu of Northwestern University in Chicago, who studied the effects of air pollution in mice. Lungs inflamed by pollution secrete interleukin-6, an immune system compound that sparks inflammation and has been shown to make blood more likely to clot. The research appears in the Journal of Clinical Investigation. It follows a study last week in the New England Journal of Medicine that found breathing diesel fumes interfered with heart attack survivors' ability to break down blood clots. Mutlu got a clue about the clotting issue two years ago when he was studying the effects of air pollution on heart failure in mice. Mice who had been exposed to pollution bled significantly less. "They were forming blood clots," he said in a telephone interview. In the latest study, he and colleagues exposed mice to particles of air pollution collected by the U.S. Environmental Protection Agency. These were mixed with a saline solution and injected into the lungs of mice. Mice exposed to pollution showed a 15-fold increase in interleukin-6 just 24 hours later. That time frame is important because some studies have shown a spike in air pollution can boost heart attacks with 24 hours. Mutlu and colleague Dr. Scott Budinger said they were able to prevent this clotting by suppressing immune cells in the lungs called macrophages that attack foreign substances and secrete interleukin-6. Mice with suppressed immune responses did not show increased blood clotting. "This suggested that interleukin-6 was the driving force," Mutlu said. He said most people understand that high levels of air pollution can make lung diseases such as asthma worse. "The same thing is not known for patients with coronary artery disease or congestive heart failure," Mutlu said. "I think we need to increase the awareness of this link among those individuals." The researchers now plan to study whether aspirin can counteract the clotting effect in mice. Low-dose aspirin helps thin the blood and is already recommended for people with heart problems. The general public associates noise with nuisance, however quantifieable health risks are involved, proving the myth "What you don't see can't hurt you"
The World Health Organization commissioned a landmark study in 2007 on the Noise impacts to human health which challenged the uneducated opinion that aviation noise is only a nuisance. Several landmark studies have been conducted by renowed scholars quantifying the effects of noise on human health. Several studies and articles are included below. Efforts are underway by various health organizations to reassess the FAA's measures of noise. DNL averaging used by NASA and the FAA is thought to be an outdated measure inadequately assessing noise impact and don't take into consideration the latest findings. Dancing Till Deaf by Ed Walsh and edited excerpts by Kathy Peck executive director H.E.A.R. Aircraft Noise: The Ailment & The Treatment by Arline Bronzaft, Ph.D. Assert Your Right to Peace & Quiet! by Arline L. Bronzaft, Ph.D. Controlling Noise Is in Our Hands by Nancy B. Nadler, M.E.D., M.A. Intrusive Community Noises Yield More Complaints by Arline L. Bronzaft, Ph.D., Elizabeth Deignan, M.A., Yael Bat-Chava, Ph.D. and Nancy B. Nadler , M.E.D., Out of the Mouths of Babes: What Children Say about Noise by Nancy B. Nadler, M.E.D., M.A. and Yael Bat-Chava, Ph.D.
Beware: Noise Is Hazardous to Our Children’s Development Arline L. Bronzaft, Ph.D.
A Voice to End the Governmnet's Silence on Noise by Arline L. Bronzaft, Ph.D.
Below is a slide from a research group at Berkley. *1. Based on FLYING OFF COURSE: Environmental Impacts of America's Airports, report by the Natural Resources Defense Council. Commercial aircraft comprise almost 70% of oxides of nitrogen (NOx) emissions from the total aircraft sector (commercial, military, and general aviation) according to the US Enviromental Protection Agency. Most Nox emissions from aircraft have been found to occur in approach, take off and climb (LTO Cycle)" says the United Nation's Aviation Agency and "they are one of the fastest growing segments of the transportation sector’s regional pollutant contribution," says the US EPA. In 1999 the EPA studied several cities where air quality problems currently exist or are likely to become more significant. The results indicate that while airports were doing a better job of managing air quality, however aircraft  induced NOx pollution, depending on the specific scenario, increase by a factor of two to three between 1992 and 2015. The five major air pollutant species which comprise the most significant emissions from commercial jet aircraft are volatile organic compounds (VOCs), carbon monoxide (CO), oxides of nitrogen (NOx), particulates (PM), and sulfur dioxide (SO2). The 1999 EPA study confirmed that "commercial aircraft emissions have the potential to significantly contribute to air pollution," and that "the projected ground-level emissions from commercial aircraft increased in absolute terms." "Airport air pollution is similar in scope to that generated by local power plants, incinerators, and refineries, yet is exempt from many of the rules other industrial polluters must follow. For example, one 747 arriving and departing from an airport in New York City produces as much smog as a car driven over 5,600 miles, and as much polluting nitrogen oxides as a car driven nearly 26,500 miles. While the government has effectively required cars to undergo emissions inspections (with resulting improvements in emissions and efficiency), airplanes have not received the same scrutiny. Meanwhile, air travel is increasing in popularity twice as fast as car travel and is projected to double within the next 20 years." A jet engine is an internal combustion engine, just like an automobile engine is. In a jet engine, the fuel and an oxidizer combust (or burn) and the products of that combustion are exhausted through a narrow opening at high speed. This is a diagram of emissions from a stack burning fossil fuels. Not unlike the emissions released by jet engines, pollutants are dispersed at different atmosphereic levels according to altitude. An emissions factor is a representative value that attempts to relate the quantity of a pollutant released to the atmosphere with an activity associated with the release of that pollutant. These factors are usually expressed as the weight of pollutant divided by a unit weight, volume, distance, or duration of the activity emitting the pollutant (e.g., kilograms of particulate emitted per megagram of coal burned). 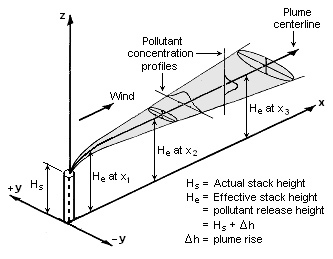 Such factors facilitate estimation of emissions from various sources of air pollution. In most cases, these factors are simply averages of all available data of acceptable quality, and are generally assumed to be representative of long-term averages for all facilities in the source category (i.e., a population average). Forecast, copy of Figure 8, 2003 op. cit. Including 1980, 1985, 1989-2001, http://www.epa.gov/ttnchie1/trends/index.html, February 2003. Ambient Air Quality Standards, Section 101(d)(1), November 15, 1990. Airports, http://www.faa.gov/arp/planning/stats/2002/CY02CommSerBoard.pdf , November 6, 2003. U.S. Environmental Protection Agency, Classifications of Ozone Nonattainment Areas, op.cit. Projects: Hartsfield Atlanta International Airport, August 2001. Improvements: Chicago O’Hare International Airport, Chicago, Illinois, June 21, 2002. Emissions, South Coast Air Basin. Forde, Region 2, U. S. Environmental Protection Agency, June 16, 2004. Additional data provided by Mr.
road and total emissions from 1999 Air Emission Inventory Summary spreadsheet, February 11, 2003.
escalated from 1995 estimate by URS Greiner, Inc. (1997) based on 2000 data provided by Tony Petruska, U.S. EPA. International Airport, June 2002 for Logan Airport emissions, which are typical for an annual value. IAH, LAX, ORD, PTI, SFO, and STL). equivalents (Tg CO2 Eq. ), which weight each gas (e.g., CO2 and NOx) by its Global Warming Potential, or GWP, value. Intergovernmental Panel on Climate Change, Aviation and the Global Atmosphere, 1999. Gas Emissions and Sinks: 1990-2001, 2003 op.cit. CO2 and NOx) by its Global Warming Potential, or GWP, value. Air and Space Symposium and Exhibit: The Next 100 Years, July 14-17, 2003, Dayton, OH. also prove potentially useful applied to local air quality emissions. Use & Reduce Emissions, February 2004. Intergovernmental Panel on Climate Change, 1999 op.cit. LTTG will evaluate the prospects for setting emissions goals as targets for future technology performance. Mitigation can be found at http://web.mit.edu/aeroastro/www/partner/. According to the NRDC's 1997 study, "In adapting a threshold of 65 dbDNL, FAA rejected EPA's health based recommendations and chose, instead, to balance the protection of public health and welfare with competing economic and technological considerations". The FAA's Noise Abatement guidelines push the implementation of such rules in to the hands of the air traffic controllers and the pilots. The responsibilty of noise abatement is then shared between the airports, airlines, local and regional government, and citizen of the communites effected. The FAA asks local governement to form "Noise Response Process" to address incidents where noise levels become intolerable. So, for example, if you are a resident of a community who is under a flight path, the FAA then makes it YOUR responsibility to call a local hotline, lodge a noise complaint with visual sighting of said aircrafts' tail number. The airport then has the responsibility of then contacting the aircraft carriers owner and levying a fine against them for violating the noise abatement procedures. If a copious amount of calls are made then, in theory, the air traffic controllers will be more apt to redirect flights away from the 'problem' area. The flaw in this program is that pilots are now encouraged to utilize parks and open spaces which will suffer from the increased air quality degradation, and the newly impacted areas will suffer the same resonsibility of having to report noise until sufficiently heard and then moved to the next community. in addition to Part 36 noise requirements. foreign certified aircraft An issue paper may be needed to address compliance with Part 36 noise requirements for validation projects from certain countries. Risk analysis studies need to be executed and delivered to area at risk for Fuel Jettison over land. In the new NAR, the land is a preferrable route to the sea where Fuel Jettison Risk was mitigated. Transportation research board studies on impacts of Aviation Jet engine emissions on flaora and Fauna. The results of this study suggest that the range of size of particulate emissions from some jet engines clusters below 1.5 ?m and that the emissions contain heavy metals. Therefore, jet exhaust particulates (JEPs) have the potential to adversely affect both the environment and human health. 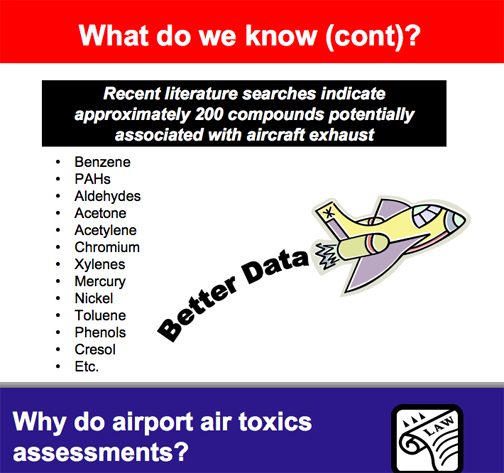 Little is known about the particulate component of jet engine emissions. Baseline physical and chemical data on JEPs were obtained to evaluate their potential effects on the environment. Particles collected from the exhaust stream of two types of jet engines were examined using scanning electron microscopy. Analysis indicated that 100 percent of the particles collected were below 1.5 ?m in size. Particles in this size range can penetrate to the alveoli of human lungs. Chemical analyses of jet engine exhaust were conducted in an attempt to identify chemical fingerprints that would distinguish aviation emissions in the environment from other anthropogenic emissions. Certain heavy metals, especially vanadium, were found in jet exhaust and may be useful chemical fingerprints. Analysis of JP-5 fuel standards revealed a suite of alkylbenzene hydrocarbons, which may also aid in fingerprinting aviation emissions. Sediment samples taken at coastal wetlands near airports indicated the presence of the same heavy metals as those found in jet exhaust samples. Field sites exposed to higher volumes of air traffic contained higher levels of sediment heavy metals, supporting the hypothesis that aerial deposition of heavy metals is occurring in areas near some airports. cirrus cloudinessall of which contribute to climate change in the stratosphere. Aviation and the environment are on a collision course." The number of airline flights worldwide is growing and expected to skyrocket over the coming decades. Aircraft emissions pollute the air and threaten by 2050 to become one of the largest contributors to global warming, British scientists have concluded. NITROGEN oxide fumes emitted by aircraft exert 30 times as great an effect on climate as the same fumes emitted at ground level by industrial processes and the burning of fossil fuels like coal and oil, British scientists have calculated. The nitrogen oxides react with other chemicals in the air to create ozone in the troposphere, or lower atmosphere. At higher altitudes, in the stratosphere, ozone blocks ultraviolet rays from the sun that can cause cancer in humans. Baughcuma, S.L., T.G. Tritz, S.C. Henderson, and D.C. Pickett. “Scheduled Civil Aircraft EmissionInventories for 1992: Database Development and Analysis.” NASA CR 4700. April 1996. Baughcumb, S. L., S. C. Henderson, and T. G. Tritz. “Scheduled Civil Aircraft Emission Inventories for 1976 and 1984: Database Development and Analysis.” NASA CR-4722. 1996. Federal Aviation Administration (FAAa). “System for assessing Aviation’s Global Emissions (SAGE), Version 1.5, Technical Manual.” FAA, Office of Environment and Energy. FAA-AEE-2005-01.September 2005. Environment and Energy. FAA-AEE-2005-03. September 2005. Gardner, R. “Global Aircraft Emissions Inventories for 1991/92 and 2015, Report by the ECAC/ANCAT and ED Working Group.” Editor: R. M. Gardner. EUR18179. 1998. Intergovernmental Panel on Climate Change (IPCC). “Revised 1996 IPCC Guidelines for National Greenhouse Gas Inventories, Reference Manual (Volume 3).” http://www.ipccnggip. Intergovernmental Panel on Climate Change (IPCC). “Aviation and the Global Atmosphere.” A Special Report of IPCC Working Groups I and II. Edited by J.E. Penner, D.H. Lister, D.J. Griggs, D.J. Dokken, and M. McFarland. Cambridge University Press. 1999. Ministry of Transport, Public Works and Watermanagement, Directorate-General of Civil Aviation, the Hague. ISBN 90-369-1792-1. July 2002. Schmitt, A., B. Brunner. “Emissions from Aviation and their Development over Time". In Final Report on the BMBF Verbundprogramm, Schadstoff in der Luftfahrt. DLR-Mitteilung 97-04, Deutches Centrum Fuer Luft- and Raumfahrt. 1997. Sutkus Jr., Donald J., Steven L. Baughcum, and Douglas P. DuBois. “Scheduled Civil Aircraft Emission Inventories for 1999: Database Development and Analysis.” National Aeronatics and Space Administration (NASA) Glenn Research Center, Contract NAS1-20341. NASA/CR-2001-211216. October 2001. United Nations Environment Programme (UNEP)/World Meteorological Organization (WMO). Article 4 of the Framework Convention on Climate Change published by the UNEP/WMO Information Unit on Climate Change (also identified in Article 12). See <http://unfccc.int>. 2000. The Australian government has commissioned severeal environmental studies on health, social, environmental, mental impacts to aircraft noise, emissions and vibrations. Based on these finding, they have adopted legislation which specifically protects the airline industry from full control of airspace. Below is an excerpt from their findings which has been incorporated into Australian law. and find them a cause of concern. divided into three distinct types; sonic booms, fixed wing noise and helicopter noise. order to avoid long-term damage. archaeological sites, historical sites andorder to avoid long-term damage. Report No. FAA-AEE-97-01, Washington, D.C., April, 1997.
, last accessed, March, 2001. 42, Fifth Edition, Research Park, N.C., May, 1998. Triangle Park, NC, October, 1986. Transp., Office of Transp. Laboratory, Sacramento, CA., Nov., 1979. 7. Federal Aviation Administration Office of Environment and Energy Home Page. Model - Draft Version, Ann Arbor, MI, June 1998. Vicinity of Airports, Report No. SAE-AIR-1845, 1998. Administration, Report No. FAA-AEE-99-03, Washington, D.C., August, 1999. 13. Wayson, R.L., G. G. Fleming, W. L. Eberhard, B. Kim, W. A. Brewer, J. Draper, J. Pehrson, and R. Johnson, 2003: The use of LIDAR to characterize aircraft exhaust plumes, Proceedings, 96th Ann. Meeting of AWMA, San Diego, CA, Air and Waste Management Association.